In the script above I only really needed to pass the BuildId which was used to grab the artifacts from VSTS but I passed the BuildName and BuildDefinition just so I could log them in TeamCity to establish a better audit trail. 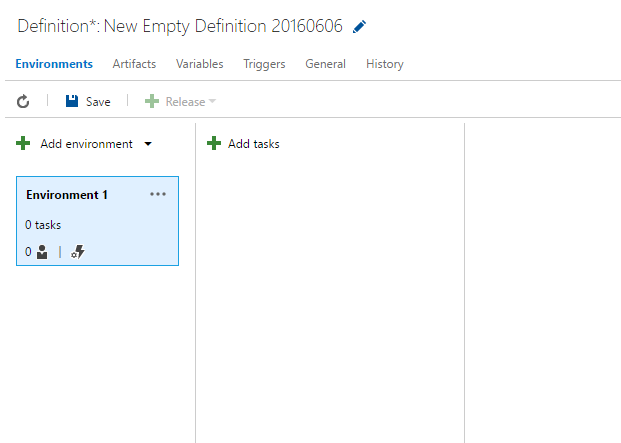 With my sweet little PowerShell script in hand I hit the magic little RELEASE link in VSTS and created a new release definition. Since it was going to be a simple task I chose to start with an empty definition and chose the project and build definition to associate the release with. I elected to use the Hosted agent queue to execute my release tasks. When I clicked Create I was presented with a workspace that allows me to customise my deployment process. The first thing to note is the box that says Environment 1. As described in this Channel 9 episode: Environments, (With Donovan Brown and David Tesar) we probably shouldn’t think of an environment as a physical machine. In the VSTS universe its actually just a collection of properties including approval schemes, variables, agent pools and the actual tasks that make up the “deployment”. With that in mind, I just renamed it to something friendly and created a task inside it to run my Powershell script. That’s where the fun started. I chose the PowerShell task and started configuring it to run my script above. I had two immediate choices for where to source my script from: File Path or Inline Script. The first choice allowed me to choose from the associated build artifacts but my PowerShell script was a meta acitivity and I definitely didn’t want to include it there just so I could execute it. The second option to include it inline seemed like the logical choice but there’s a size limit and my script wouldn’t fit in there. 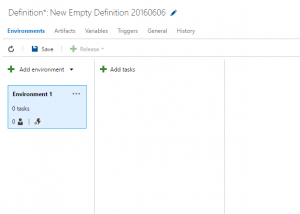 Thanks to Developing a Custom Build vNext Task series by Colin Dembovsky I was able to put together a build task pretty quickly to enable me to trigger the TeamCity build. As an added bonus, the build task provides a first class interface to allow users to configure the task with more guidance than purely executing a Powershell script. The first step is customise the manifest to instruct VSTS as to what the input parameters should be for the build task. "helpMarkDown": "The Id of the build in VSTS to retrieve artifacts for deployment." "helpMarkDown": "The definition name of the build in VSTS." "helpMarkDown": "The name of the build in VSTS. This corresponds to the version of the application." "helpMarkDown": "The Id of the build in TeamCity to execute." This final result of this manifest will be a neat little interface to configure the build task and the ability to provide extended guidance for the user. The thing I quickly realised is that the Powershell script is used only if you are executing the release on a Windows based build agent. As I was using the hosted agent, the Node.JS implementation was what I was actually after. Thankfully the second post in Colin’s series gave me the direction I required to pull this off. After a bit of experimentation (and learning enough Node.JS to be dangerous) I came up with the following script. With all that in place I could now create a release, point it at any build output and execute it in TeamCity. When the TeamCity build executed it would retrieve the build artifacts from VSTS (As covered in my last post) and perform the deployment as it always had. I could now even trigger the release off a build on our staging branch and deploy directly to one or more QA environments.